Andrew Horne (Xena Chemicals / Budd Power van Diemen) made things look easy at the final round of the 2018 Investchem Formula Ford Kent Championship at Zwartkops Raceway on Saturday, 3 November. Heading into the event, the former multiple champion had an eight-point advantage over his closest rival, David Jermy (Beauty Factory van Diemen) but didn’t take any prisoners, claiming pole position, winning both heats and setting the fastest lap time of the day for good measure on his way to his fourth title. He was followed over the line in both races by Jonathan Nash (Turnfab Engineering Swift) with Paul Gerber (Pablo Clark Racing Ray) and 2017 champion Dean Venter (TEU Southern Africa Swift) sharing the third places. The morning qualifying session was interrupted by a red flag when one of the Formula Monoposto cars, which were running with the Formula Fords, ended in a dangerous position after spinning off the track. Prior to the stoppage, Horne had set the quickest time, but once the cars returned to the circuit it was Nash who was quickest, until the final minutes of the session when Horne put in the only lap under 1’08” to claim pole position and demote Nash to second. Gerber and Venter shared the second row of the grid with Jermy, the only one with a chance of stopping Horne from taking the title, in fifth ahead of James Reeves (Ray) Dalan Holton (Debella Finance van Diemen) and Steve Venter (TEU Southern Africa Swift) rounded out the top eight. Slight wheel spin meant Horne was a bit slow off the line at the beginning of the first race, allowing Nash through into the lead, but by the end of the opening lap he had regained the lead and was then able to control things from the front, taking the win and with it the championship. Nash crossed the line just half a second adrift. Jermy was closest to the leading duo in the early stages, but an off-track excursion dropped him down the field. This left Gerber and Dean Venter to fight for the remaining podium position. They swapped positions regularly throughout the remaining eight laps, never separated by more than a couple of car lengths. Gerber was in front when it counted, taking third by just over three-tenths of a second. Holton, who was disappointed with his qualifying time, worked his way up to fifth just ahead of Reeves with Jermy less than a second back. Steve Venter ended in eighth. In the second race, Horne again suffered from Wheel Spin trying to get off the line and Nash again grabbed the lead. This time it took Horne nearly three laps before he could get to the front but, once there, he was able to open a gap and take a comfortable win. Behind him, Nash, Gerber and Dean Venter spent a couple of laps fighting for second before Nash and Venter were able to pull away slightly. They continued their battle until the finish, Nash managing to stay ahead and take his second runners-up finish of the day. With Nash and Venter beyond his reach, Gerber soon had his hands full trying to hold off Jermy. They were joined by Holton, who had found some speed in his car in the gap between races. While Gerber and Jermy were fighting each other, Holton took advantage and slipped past the pair of them at the top of the hill to take fourth, a position he held until the flag. Gerber and Jermy continued their battle until contact between the two on the final lap dropped Jermy down to sixth behind Reeves and Gerber down to eighth behind Steve Venter. In the day’s overall standings, Horne took victory ahead of Nash and Dean Venter. Horne’s full-house points haul on the day gave him a 25-point advantage at the top of the final championship standings, 109 points to Jermy’s 84. Nash’s two second places on the day were just not quite enough to give him third on the log; he finished in fourth, a single point behind Dean Venter. 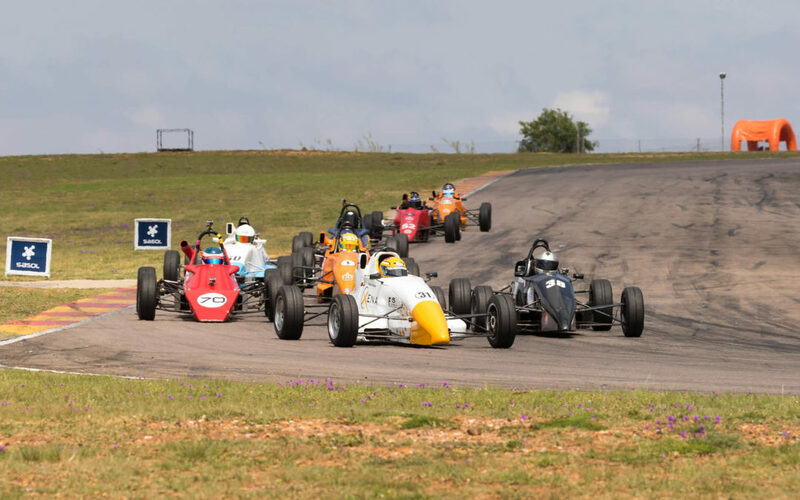 The Investchem Formula Ford competitors return to the track on 27 April when the first round of the 2019 championship is scheduled to take place at Phakisa Freeway, just outside Welkom in the Free State.